Dr. Dima Dabbous-Sensenig, IPJ director Magda Abu-Fadil and Mrs. Jeannette Mufti speak on empowerment of women in politics and media at LAU alumni forum. 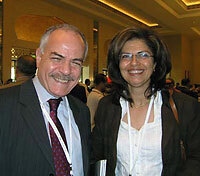 Asharq Al-Awsat editor/correspondent Sana’ El Jack and Abu-Fadil at Dubai media conference. LAU Alumnus Firas El Amine, corporate communications director at Dubai Holding, joins media fray. Jane Arraf, formerly of CNN and alumna Samia Nakhoul of Reuters discuss their war coverage experience. 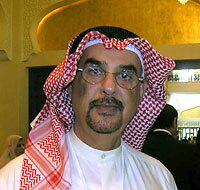 “Hewar Al Arab” (The Arabs’ Dialogue) editor-in-chief Mohammed Al-Rumaihi. Al Arabiya talk show host and An-Nahar Washington correspondent Hisham Melhem with Sana’ El Jack. Bassam Zaza, LAU alumnus and reporter for Gulf News, covering media conference. Writer Mona El-Tahawy, alumna Donna Abu-Nasr of the Associated Press and Laurie Kassman, communications director at Washington’s Middle East Institute, attend “Women in Media” dinner at Burj El Arab. 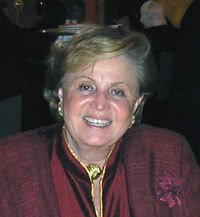 LAU alumna, Board of Trustees member and Board member of the ATF Suad Al-Juffali. Professor Suad Joseph, University of California-Davis, is editor-in-chief of the Encyclopedia of Women and Islamic Cultures. Dr. Margot Badran, Georgetown University, and Abu-Fadil at “Women in Media” dinner. 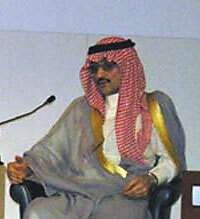 Prince Al-Waleed bin Talal addresses capacity audience at Dubai media conference. The Institute for Professional Journalists helped promote LAU at two conferences in Dubai on women’s empowerment and international media, respectively, adding to the insitution’s visibility on the Middle East and world scenes. LAU’s Dubai and Northern Emirates–based alumni organized a forum on the “Role of Higher Education in the Empowerment and Achievements of Arab Women” that underlined LAU’s pioneering history and role in the region. 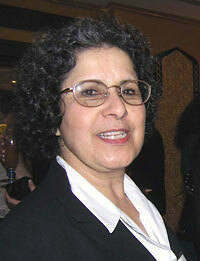 “Women’s issues are neglected from the debate,” said alumna Dr. Dima Dabbous-Sensenig, director of LAU’s Institute for Women’s Studies in the Arab World, during the daylong forum on December 3, 2005, as she pointed to stereotyped role models in the media, where physical attributes surpass mental qualities. Other speakers included alumnae Jeannette Mufti, a one-time parliamentary candidate in Jordan who has been active in academia and charity work for years, Dr. Hissah Al-Sabah, Vice President of the Committee for Women’s Affairs in Kuwait, Mrs. Taline Avakian, who helps run an internationally renowned family jewelry business and is a member of LAU’s Board of Trustees, novelist/researcher Emily Nasrallah, philanthropist Maha Kaddoura, and, Lebanon’s Consul-General in Dubai, Mrs. Donna Turk. IPJ director Magda Abu-Fadil’s presentation on “Media & Women in the Middle East & North Africa” touched on obstacles and constraints facing women in the MENA region, the impact of regional media, ethics, standards and training, new media, solutions and recommendations. 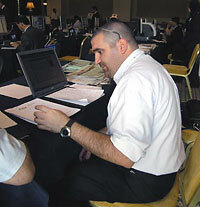 Elsewhere in Dubai, Abu-Fadil attended the “Arab and World Media Conference 2005: Getting it Right” conference that drew 1,000 participants representing media experts, journalists, academics, advertising and high-tech organizations from around the world to discuss ways of bridging the East-West cultural divide. The conference December 5–6, 2005 featured such speakers as Prince Al Waleed bin Talal, former CNN Baghdad bureau chief Jane Arraf, LAU alumna and Reuters Gulf bureau chief Samia Nakhoul, Al Arabiya TV channel general manager Abdel Rahman Al-Rashed, International Herald Tribune executive editor Mike Oreskes, Assafir editor-in-chief Joseph Samaha, Washington Post columnist David Ignatius, CBS News Correspondent Sheila MacVicar, Public Broadcasting CEO Pat Mitchell, Arab League Secretary General Amr Moussa, New York Times Middle East correspondent Hassan Fattah, USA Today Senior Diplomatic Reporter Barbara Slavin , LAU alumnus Fadi Ismail, general manager of 03 Productions and Riz Khan of Al Jazeera International, to name a few. The topics included insights into the world press, censorship, reporting on political Islam, citizen journalism, covering the war on terror, social responsibility, freedom and propaganda, and the roots of prejudice. The event was organized by the Arab Thought Foundation and the Dubai Press Club. Abu-Fadil wrote an article on the need for professionalism and ethics in media (PDF) for “Hewar Al Arab” (The Arabs’ Dialogue) a monthly journal published by the ATF.